The Levant is the part of the world where continents and empires collide, the crossroads where east meets west with a passing wave at Africa. It centres around the Eastern Mediterranean, encompassing countries like the Lebanon, Syria, Jordan and Turkey, the crucible of the Mediterranean and an area still very much at the forefront of world news. The food of the Levant is rich and diverse, holding the northern parts of Iran as its spiritual home, because the rulers of the surrounding lands in centuries past highly favoured Persian cooks, who took their food far and wide in the region. Dishes may be similar across the Levant, but there are differences in preparation, and a dish made in the Lebanon could be markedly different from the same dish made in Syria, or elsewhere. This difference in regional style adds to the depth of the region’s cuisine … Lebanese food centres on tartness and fresh flavours, meat and fruit are common combinations in Syria and Iran, Jordanian and Palestinian food leans towards subdued, comforting flavours, where big, complex flavours are king, yet all have a common theme of ingredients, flavour and technique. , is as comprehensive and encyclopedic a view of the cuisine of the Eastern Mediterranean, or Middle East, as you’re likely to find, a fascinating, engrossing and beautiful account of a life illustrated by food. Helou grew up between Syria and Lebanon, and documents the food of her home countries delicately and in detail, widening her attention to the surrounding lands, describing in detail the food and customs of these most vibrant and vital of culinary lands. 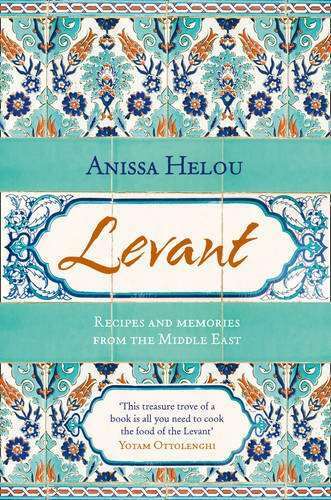 Yotam Ottolenghi, himself no stranger to the food of the Levant, describes Helou’s book as ‘a treasure trove’, and he’s absolutely right. There’s so much here, so much to cook, set out simply and easily, married with memories and insightful, incisive observations. Helou’s superb prose is evocative and inspiring. I’m tempted to make her ice-cream in the same way that the men in the souk do, instead of in a boring machine. She has an ability to bring her food to life with her stories and observations, an ability to ground her food in the life of the area, in the way people live, love, learn and eat. for a while now, and I’ve resisted writing about it for some time, simply because I’ve enjoyed picking it up every now and again, reading a recipe or two, savouring Helou’s descriptions and stories. It’s silly, but I didn’t want to share it because it’s great, too good. I wanted this treasure of a book to be my secret … but that’s stupid and arrogant, so here it is, one of the very finest cookbooks I’ve read this year, if not ever. Absolutely superb. I’ve tended to avoid Anissa Helou after buying and reading “The Fifth Quarter” – I found her, in that book, to be incredibly dismissive and patronising of many other cuisines of cultures that weren’t her own. There were also a lot of recipes in that book that she said she had never made herself which struck her off my list as a source of reliable recipes. Does she appear to you to be exhibiting these traits here? Has she actually tried all the recipes this time 😛 ? …didn’t spot any of that, and really enjoyed her style. No hint that these recipes weren’t tested.